This is a recipe for a rich roasted Roma tomato soup with onions, carrots and celery. 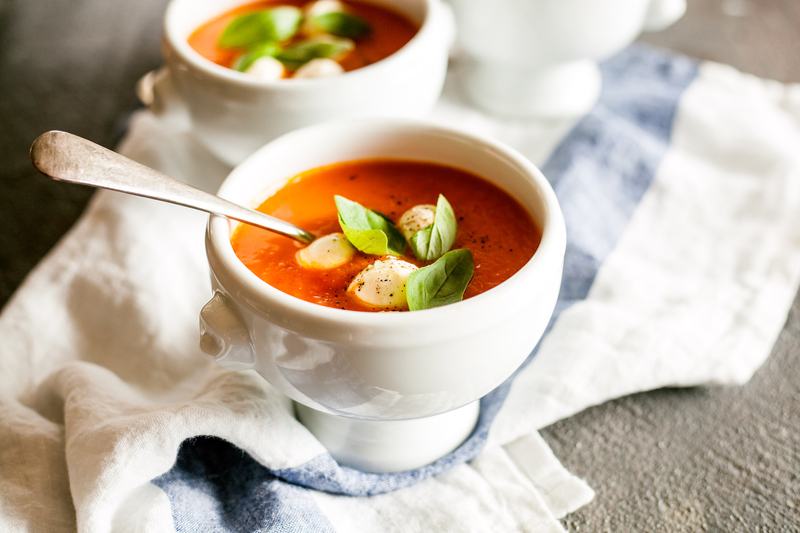 One of our favourite food secrets is the addition of Bocconcini to soups. When you drop Bocconcini into hot soup, they transform into soft, gooey pillows of hot cheese. 1 Preheat the oven to 160°C. Place Roma tomatoes, cut-side up, on a baking tray. Top with sugar, drizzle with oil and season. Roast for 30 minutes until softened. 2 Meanwhile, heat butter and 1 tablespoon oil in a pan over medium heat. Cook onion, carrot, celery and garlic, stirring, for 4-5 minutes until softened. Add canned tomatoes, basil, stock, roasted Roma tomatoes and any cooking juices. Bring to the boil, then reduce heat to low and cook, stirring occasionally, for 30 minutes. 3 Allow the mixture to cool slightly, and blend the soup in batches. 4 To serve, you may need to reheat. Pour soup into serving bowls and drop the desired amount of bocconcini into the bowls, allowing them to begin to melt. Season to taste and garnish with extra basil leaves. A stunning grilled eggplant & Traditional Bocconcini stacked in a round on a plate.